It's unclear whom the new coordinator will have under center next season, but he intends to get the most out of a versatile group of skill players. With a rebuilding project imminent, getting a head coach with considerable experience could prove difficult for the Dolphins. The Dolphins' rookie running back has come a long way since being kicked out of the huddle by Ryan Tannehill in training camp. Over the past 11 months, the NFL has produced two jaw-dropping miracle plays that defied logic and snatched a victory. Which one reigns supreme? It didn't work exactly the way it was scripted, but the Dolphins improvised, turning a certain loss into a win and staying alive in the AFC race. South Florida once again proved to be a nightmarish destination for the Patriots, who couldn't stop a multiple-lateral play to clinch the AFC East. Teammates and coaches share their stories about Dolphins RB Frank Gore, marveling at his work ethic, football acumen and incredible longevity. The Dolphins cooled off after a 3-0 start but still have optimism heading into the season's stretch run. In separate third-quarter plays, Danny Amendola threw a touchdown pass on a trick play and DeVante Parker gained 46 yards in an unorthodox way. The spat between the underachieving receiver and the team went public on Sunday, but the Dolphins now desperately need receivers on a short week. Gore's mentality and work ethic are inspiring the Dolphins, and he's certainly not running like a 35-year-old. The Dolphins were on the brink of a devastating defeat more than once on Sunday, but Miami came through in a wild overtime victory. As Week 6 continues, it's a good time to consider injecting your fantasy team with a boost of productivity. NFL Nation has you covered on suggestions. 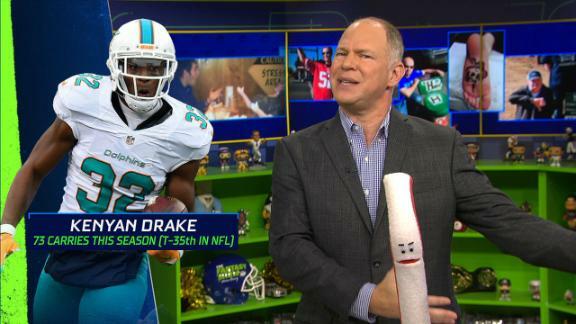 Fantasy players will groan, but the Dolphins believe they need both Gore's consistent approach and Drake's big-play potential.